TPU published photos and specifications of Zotac's upcoming ZT-Z68 Crown Edition-U1DU3 motherboard, you can check it out over here. Seen here is what the Chinese press is referring to as "ZT-Z68 Crown Edition-U1DU3", we may have lost the correct name in translation, but let's call it ZT-Z68-U1DU3 for now. 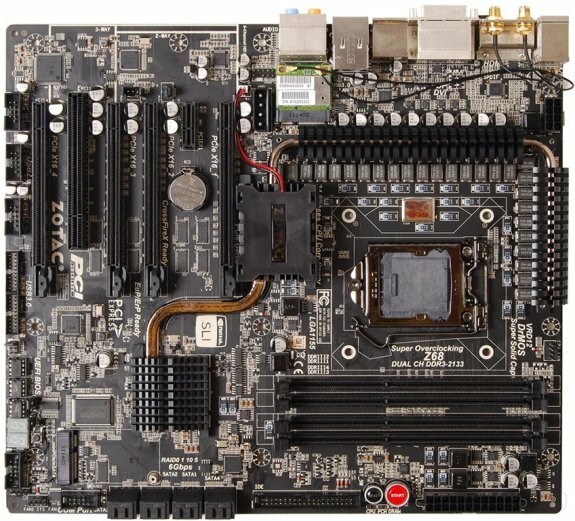 It is a full-size ATX motherboard that takes socket LGA1155 Intel Sandy Bridge and future Ivy Bridge processors, and is based on the Intel Z68 Express chipset. It combines a strong VRM to support extreme overclocking, with graphics expansion, adding 4-way NVIDIA SLI and AMD CrossFireX capabilities using an NVIDIA BR-03 bridge-chip that sits on the processor's PCI-E x16 link, to give out two PCI-Express 2.0 x16 links, which are then spread between four slots in x16/NC/x16/NC, x16/NC/x8/x8, or x8/x8/x8/x8 lane configurations.